Arnaldo Pomodoro, an artist of international acclaim, is widely regarded as Italy’s greatest post-war avant-garde sculptor. In creating his iconic reliefs Pomodoro was heavily influenced by Constantin Brancusi, the“patriarch of modern sculpture”, adapting his clean, smooth sculptures and "reverting them" to a previous, almost “archaic state”. Pomodoro is a globally recognized sculptor with important solo exhibitions in New York, Japan, France, Brazil, Germany, among others. He has won such prestigious awards as the Carnegie Institute International prize in 1967 and the Henry Moore Grand Prize in Japan in 1981. Along with being one of the twentieth century’s most important sculptors, Pomodoro is also renowned for his stage designs, teaching in numerous universities and being the founder of the Continuità Group in Italy in 1961-62. Arnaldo Pomodoro, widely regarded as Italy's greatest post-war avant-garde sculptor, drew on all his skills to create our Scatola from 1961- his “architect's sense of scale, volume and proportion; (his) set designer's feel for drama, presentation, and narrative; and (his) jeweler's facility with metal and devotion to detail.” A construction of sorts, this sculpture is composed of separate cast bronze segments or stages that have been built one on top of another. The presence of opposing vertical and horizontal forms in the piece creates a sense of slow forward motion marked by stops and starts, a kind of hesitation and then a re-commitment. Yet the movement in the sculpture is ultimately forward and then upward. Such a play on the part of Pomodoro implies a path of growth and renewal. This enigmatic work is replete with opposing forces such as conflict and reconciliation and destruction and renewal, themes the sculptor had previously explored in his bronze reliefs that incorporate his personal sculptural handwriting – the use of positive and negative spaces, puzzling symbols, suggestive marks, and cross-hatchings. The verso side of this spectacular sculpture that evinces a sense of monumentality is filled with small bronze tabs or rectangles in an unusual and exciting configuration. 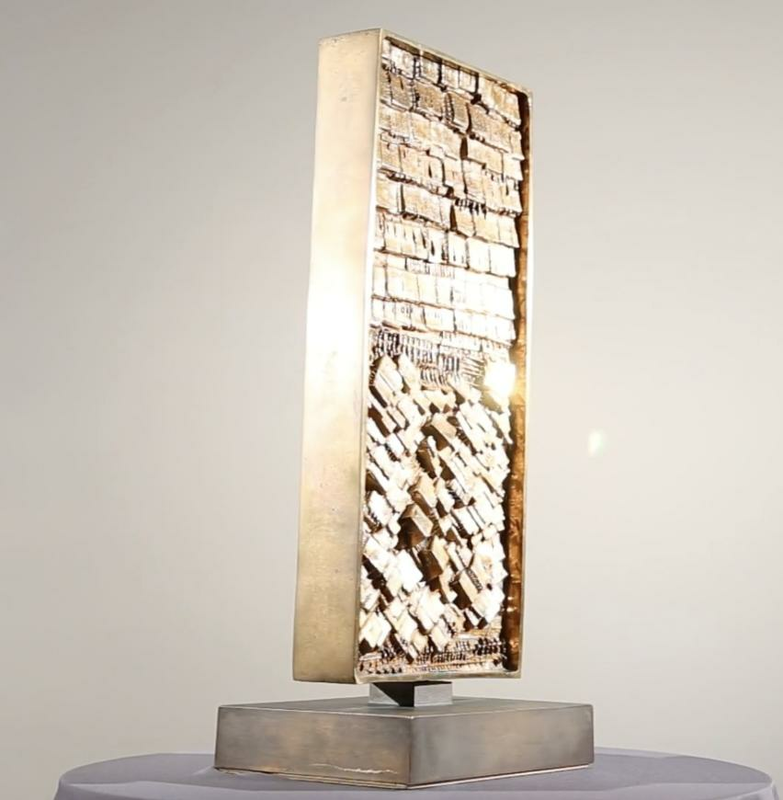 The bottom half is an amalgam of small bronze tabs arranged in a “sideways” or titled configuration that gives texture and imparts interest as well as substance to the sculpture. The top half of the verso displays an orderly row of horizontally arranged rectangles neatly controlled and assembled, implying a sense of resolution as the viewer reaches the top of the piece or symbolically the end of the journey. Similar examples from the early 1960s are in the permanent collections of the Museo del Parco in Portofino, Milan's Museo della Permanente, and the Peggy Guggenheim Collection in Venice.